The menu contents. 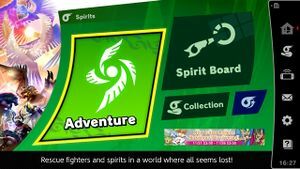 Options for "Adventure Mode", "Spirit Board", and "Collection" can be seen along with an event for the Spirit Board. The Adventure Mode tagline at the bottom reads "Rescue fighters and spirits in a world where all seems lost." Spirits (スピリッツ, Spirits) is a main menu item in Super Smash Bros. Ultimate. Adventure Mode: World of Light is the single player campaign of the Spirits menu. There is three save slots and the player can chose the difficulty from the choices Easy, Medium, and Hard. After an opening scene telling how it all started, the player first controls Kirby to travel among the World of Light and obtain as many Fighters as possible and Spirits via Spirit Battles. They are also tasked in defeating Galeem and to do so, Giga Bowser, Galleom, and Rathalos must be fought to destroy his shield and then win a battle against Master Hand. After defeating Galeem, Dharkon arrives from a crack in the sky and rivals Galeem. The fighters are now transported to the Dark Realm from a void and achieve the same goal against Galeem, defeat Dharkon. Once done, the rivalry against Galeem and Dharkon finally coming to an end, called The Final Battle. After rescuing the last fighters, the player must now fight Dharkon only, Galeem only, or both at once but requiring to go through a series of long stages first. Respectively, only defeating one of them will grant a bad ending showing them consuming the entire universe in their ways while defeating them both features them falling lifelessly into the ocean and then exploding, finally freeing the spirits to return to their original world. Spirit Board is a sub-menu that is a single player mode within the Spirits menu. On screen, there will be a group of Spirits that can be obtained via Spirit Battles and up to 10 can appear on the board. The battles pit the player against a Spirit-possessed player called a Puppet Fighter and with special conditions (for instance, a Dr. Mario Puppet Fighter with a Dr. Wily Spirit requiring the player to combat against an army of metal Mega Men before fighting the possessed Dr. Mario containing said spirit). If the player wins the Spirit Battle, they now must aim the given shooting device to shoot the Puppet Fighter to obtain the Spirit. There is a shield protecting the Puppet Fighter and if shot instead, they can be given a second chance to shoot the Puppet Fighter again but it costs Spirit Points depending on the Spirit rank. Collection is a sub-menu that leads to other modes within the menu such as Team Setup in which the player is able to create a Spirit Team and save it with a name. Other modes include Level Up where the player can feed their obtained primary spirits with Snacks or Cores to increase their level or enhance them if labelled with "Can be Enhanced at Lvl. 99." Dismiss is where the player can send spirits back to their original world and obtain their cores and sell them, feed it to a primary spirit, or to summon other spirits. Summon is where the player can summon another spirit but only if they have sufficient cores needed to summon said spirit. Inventory contains two modes, Spirit List to view spirit images and its series and Items to sell Spirit Board items and cores obtained from spirits. When Ultimate's main menu was initially revealed during the August 8, 2018 Nintendo Direct, the name and symbol of the menu item were obscured, with series director Masahiro Sakurai teasing the existence of the "mysterious mode." This menu item was revealed the day after Halloween (October 31), itself celebrated as All Saints' Day in some parts of the world (as well as November 1st), and before All Souls' Day (November 2nd). From October 31st to November 2nd is also Día de los Muertos (The Day of the Dead) in Mexico. Halloween, All Souls' Day, and Día de los Muertos are all associated with "spirits". As a possible reference to this, the November 1, 2018 Direct revealing this mode states that the Spirits referred to are "not the spooky kind", as Halloween is a holiday commonly associated with "spooky" ghosts and spirits. This page was last edited on April 14, 2019, at 01:36.